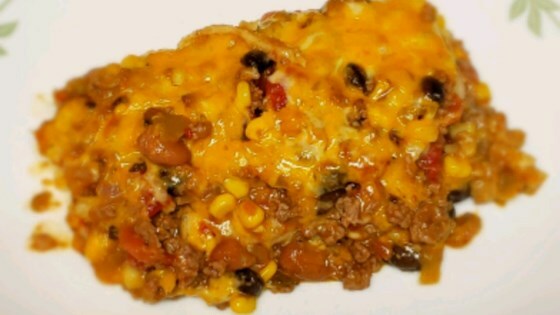 "This a very easy and tasty casserole; great with a salad, chips and salsa." Brown the ground beef in a large skillet over medium high heat. Add chili powder, beans, tomatoes and soup; mix well and heat thoroughly. Line a 13x9 inch dish with tortillas. Then make a layer with the meat mixture. Make another row of tortillas, then finish off with rest of meat mixture. Top with grated cheese. Bake in a preheated oven for 30 minutes. A simple ground beef casserole for weeknight dinners. This is very good and easy to make. I decided to layer the cheese throughout the casserole because 4 cups of cheese just sitting on top of the casserole seems like a lot.